The biggest infrastructure project in Canadian history could be finalized as early as today, with news reports yesterday that Royal Dutch Shell and its partners have reached a final investment decision on the mammoth, C$40-billion LNG Canada project in Kitimat, British Columbia. “LNG Canada augurs a new wave of investments for major gas export projects after a three-year hiatus forced by a global supply glut,” Bloomberg reports. The project “will be able to send cargoes from Kitimat—a 14-hour drive north of Vancouver—to Tokyo in about eight days, versus 20 days from the U.S. Gulf” of Mexico. The project could eventually export 26 million tons of LNG per year. While the initial approval is limited to 13 million, a second phase to double capacity “is all but an inevitability” due to the economies of scale, National Bank of Canada analysts reported in May. Consortium partners include Shell, with 40% of the project, Malaysian state fossil Petronas at 25%, PetroChina and Mitsubishi at 15% each, and South Korea’s Kogas at 5%. The initial news coverage focused on shifts in demand, particularly in Asia, that are expected to undo a natural gas glut that led Petronas to abandon  its own $36-billion Pacific NorthWest LNG project in July 2017. At the time, economist Jim Stanford said Canada had dodged an economic bullet when Petronas stepped away, contrasting the country’s more deliberate regulatory system with a detailed account  of an ill-fated and expensive LNG boom in Australia. But that hasn’t been the tone of the more recent coverage of the LNG Canada decision. 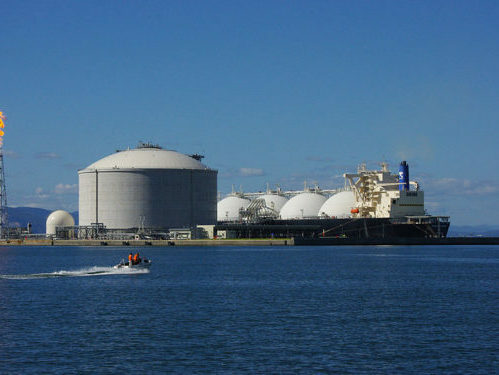 Industry analysts also see the LNG Canada deal triggering a new wave of investment in the industry. “We think 2019 could be the biggest year of LNG final investment decisions ever,” Wood Mackenzie analyst Nicholas Browne told  Bloomberg last week. If the project does proceed, Green added, B.C. will need “best in class” methane rules to keep it as clean as possible. Global notes that the project could test the political alliance that has the B.C. Green Party backing John Horgan’s New Democrats in a minority legislature. The parties’ Confidence and Supply Agreement (CASA) requires the government to draft a climate plan to reduce emissions 40% by 2030 and 80% by 2050, and Green leader and climate scientist Andrew Weaver thinks that can’t be done with LNG development. Global couldn’t reach Weaver for comment Sunday, but he tweeted that failing to deliver on the climate plan would break the deal. “Basically, it appears that @AJWVictoriaBC got snookered in the CASA deal and has become a paper tiger,” replied Norman Spector, a former chief of staff to then-prime minister Brian Mulroney and deputy minister to then-B.C. premier Bill Bennett. Last week, Horgan was upbeat about a project for which his government announced lavish subsidies  in March. 2 Comments To "BREAKING: $40-Billion LNG Canada Project to be Announced as Early as Today"
In light of what James Hanson, Bill McKibben, Roy Scranton, David Suzuki, Kathleen Dean Moore, Michel Mann, the Paris Accords, and many others have written, this project is potentially a sacrifice of humanity for egomaniacal profit and greed. It should be vetoed by all people who care about life on this planet.